Cyclist Sally Turner seeks sponsors as she qualifies to represent Great Britain in a world championship event in France. Uckfield cyclist Sally Turner has qualified to represent Great Britain in a world championship event in France this summer. Mother-of-two Sally, 35, who grew up in Uckfield, attending Holy Cross Primary School, and Uckfield Community Technology College, lives in Hunters Way. She teaches at Warden Park Academy and for Mid Sussex Active and won her place in the GB team when competing in a qualifier in Glasgow. She missed out on gold by six seconds and qualified as silver medallist for the world time trial Union Cyclist Internationale event in Albi in August. Sally said: “I am now looking for funding to go to the south of France to represent Great Britain. “In order to give myself the best chance I am looking at getting a new disc wheel for about £1,500 and all competitors have to pay their travel and accommodation, which will cost me around £1,000. Between the ages of seven and 18 Sally represented Great Britain in tennis, played junior Wimbledon and had a world ranking. She then took a few years out and got her A-levels, went to university and became a teacher. She now has two children who go to St Philip’s and UCTC, Dylan, seven, and Lucy, 12. 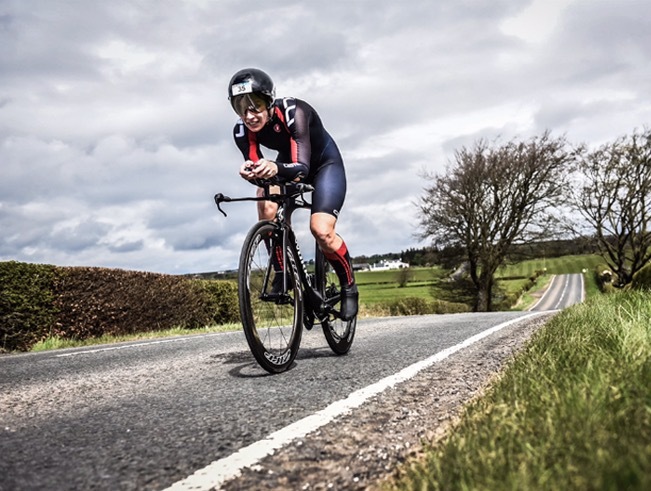 Sally took up triathlon in 2014 and in her first year qualified to represent Great Britain in her age group, went to Edmonton and finished fourth in the world. In 2015 she went to Chicago world championship triathlon and finished fifth in the world. In 2016 she did the European duathlon, run, bike, run, and won the Europeans, age group 35-39 and came fourth in the world championships in Spain. If you would like to help Sally on her way to France by making a donation towards her costs or in sponsoring her please email her on sturner@wardenpark.co.uk.